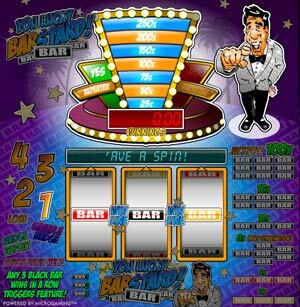 You Luck Barstard is a 3 reel, 1 payline, UK pub style online slot machine. With the classic nudge & hold features typical of fruit machines. This slot is a welcomed addition to casinos which are overloaded with US style multi line slots. The bonus ladder feature is very generous but is infrequently activated as it requires 3 black bar win spins in a row to activate it. The Nudge feature is random and enables you to bump a reel to display the next symbol. You can be awarded up to four reel nudges. You can also Gamble, Repeat or store unused nudges. The Hold feature is random and offers holds on the next spin. This enables you to hold up to three reels in the same position for the next spin. The bonus game is activated after 3 consecutive black bar win spins. In the bonus game you are taken to the ladder section which begins to flash up and down, click the Stop button to stop the flashing ladder on a multiplier value which allows you to win up to 250x your bet (more if you are lucky with the repeat feature).